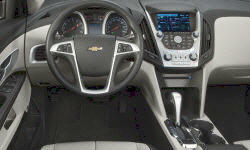 Why the 2010 Chevrolet Equinox? i LOVE THE INTERIOR, IT HAS PLENTY OF 12 v POWER OUTLET FOR WHICH i NEED i HAVE A DASH CAM, RADAR DETECTOR, AND A GPS ALONG WITH MY CELL PHONE CONNECTION AND IT IS ALL EASY TO HOOK UP. iT ALSO HAS LEG ROOM IN THE FRONT AND IS VERY COMFORTABLE, YOU CAN CARRY FIVE PEOPLE EASILY WITH A LOT OF LEGROOM IN THE BACK, YOU ALSO HAVE A LOT OF STORAGE SPACE IN THE BACK HATCH AREA. BETWEEN THE FUEL ECONOMY AND THE ROOMINESS OF THE INSIDE IS THE BEST THINGS GOING FOR THIS CAR. 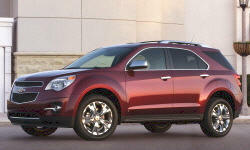 Why Not the 2010 Chevrolet Equinox?